The Deadly Gentlemen (USA), playing 'epic folk and grasscore', will be touring in Britain, Denmark, Germany, and Switzerland for a month from late November 2011. During most of this time, they will form part of Rainer Zellner's 3rd Bluegrass Jamboree! travelling festival. The band consists of Greg Liszt (banjo, vocals); Stash Wyslouch (guitar, vocals); Mike Barnett (fiddle, vocals); Dominick Leslie (mandolin, vocals); and Sam Grisman (double bass, vocals). Their tour schedule at present shows full details for six confirmed dates (21-7 Nov.) in Britain (details have already appeared on UKBluegrass.com), and one in Denmark (29 Nov.) at the Islandsbrygge Kulturhus, Copenhagen. Full details of the 3rd Bluegrass Jamboree! shows can be seen on the Jamboree website or below. 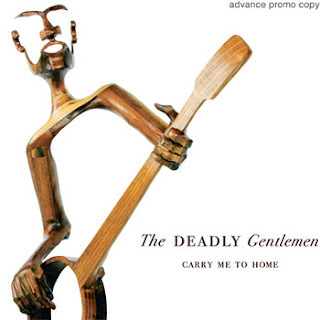 Carry me to home, the new CD by the Deadly Gentlemen, can be downloaded from the band's website. They are also responsible for the entertaining Bluegrass Intelligencer.